My Patricia Nash collection – all pulled together and ready for my trip overseas on Monday! On Monday I’ll be taking a trip…an adventure… Two weeks off of work. I can’t remember the last time I did that for a vacation. In fact, I don’t think I’ve ever taken that long off to take a vacation and actually go somewhere and completely disconnect. 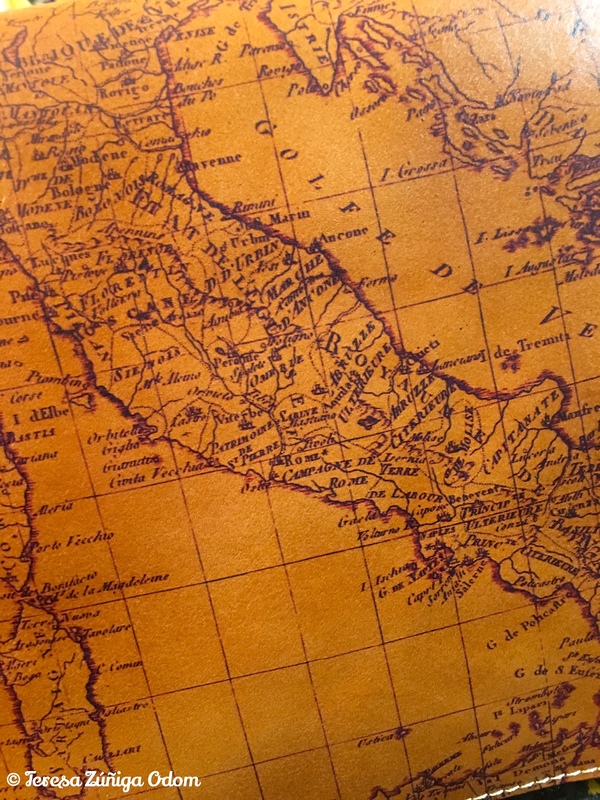 My husband and I are traveling overseas…(more on where later)… so since this is a much longer trip. I’ve been trying really hard to keep it simple and make sure that everything I take is compact and useful. The main thing that I have been concerned with is how to take my camera and zoom lens. I found a smaller camera backpack at Target a few weeks ago and it worked great when we traveled to Austin, Texas last weekend. I like it because it’s not cumbersome and it’s just the right size for my camera and the zoom lens as well as a few accessories. I love maps…so how could I NOT love this over the shoulder purse with a map on it?! Perfect for travel! I also needed something to carry my passport in….something small that also holds my driver’s license and a few credit cards and my immunization records. 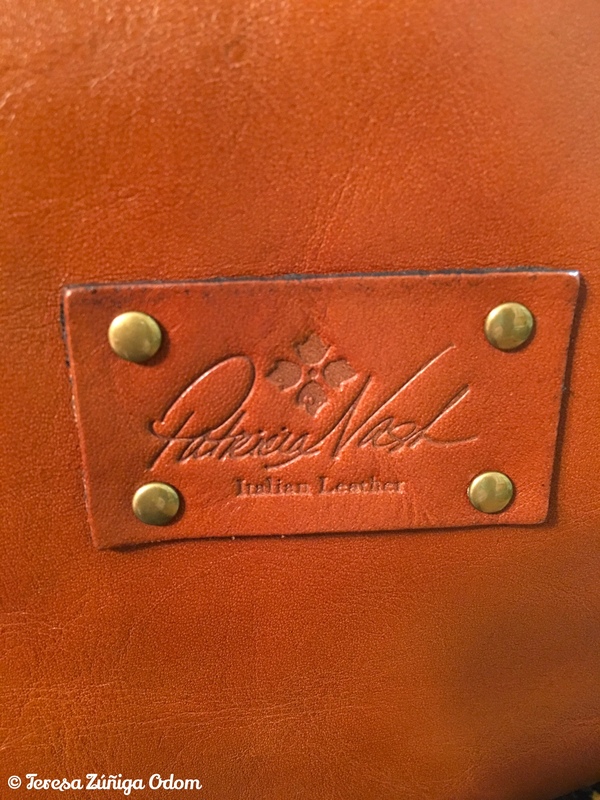 I was shopping at Macy’s when I discovered Patricia Nash leather handbags. What drew me to the wallet was actually a large satchel bag with a map on it. 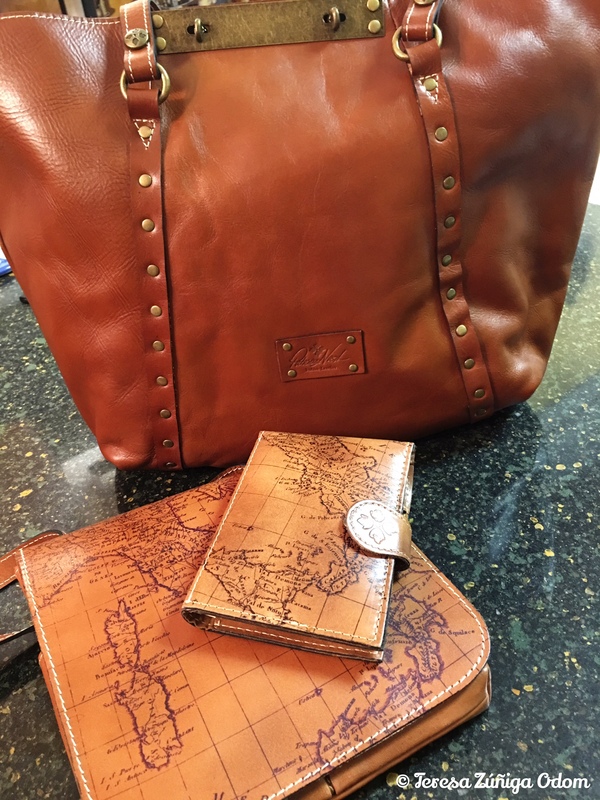 I considered the satchel but decided instead on the wallet and a cross body bag – both with maps on them. They worked well on our weekend trip to Austin. Patricia Nash Italian Leather handbags and accessories…discovered them at Macys and bought my handbag and passport wallet there. I bought my satchel through Amazon. Love this collection! So beautiful! As I was preparing for the Austin trip though, I realized that I didn’t have a good satchel bag and so I went back to the Patricia Nash collection and chose a solid leather satchel. I ordered it through Amazon and it arrived while I was in Austin. It’s beautiful too… I slipped the cross body bag right into it along with my travel journal. There is also plenty of space for my Nook and a few other things! I think it’s going to be easy to travel with the satchel and the small camera backpack. Really…I want to keep the “stuff” I carry to a minimum! This is my first trip out of the country in a long time so this spoke to me, I guess you could say. I also don’t believe in accidents…finding this necklace was predestined. It will be one of the only jewelry items I wear on my trip – again, trying to keep it simple. 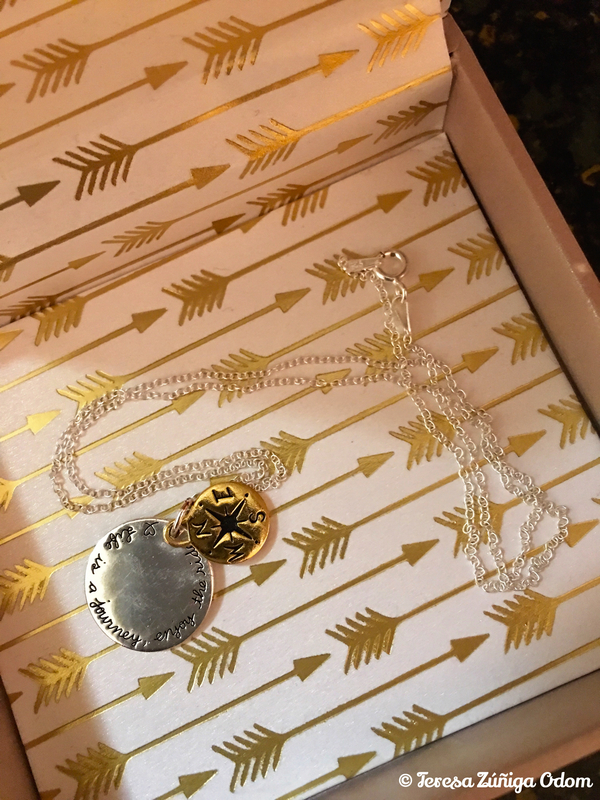 My new “travel” necklace…I really love the cardinal point part of the necklace. 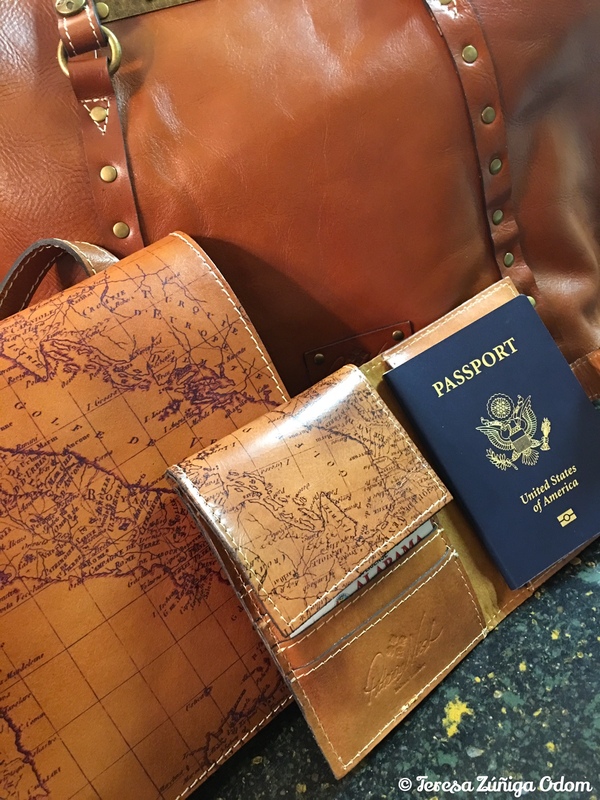 This entry was posted in Patricia Nash, Travel and tagged Leather bags, Patricia Nash, Satchel, Travel on August 21, 2016 by Southern Señora. This past weekend I attended, along with my husband and daughter, a candlelight interfaith vigil to protest an anti-immigrant bill that was signed into law by the governor of my state. This misguided law goes into effect Sept 1st and if you believe the comments on media stories you would think we were back in the 60s and that everyone in the state was anti-immigrant. The day the governor signed the bill, with the state representatives who sponsored it smiling broadly next to him, I felt sick to my stomach. Comments ranged from “this will send them all back where they belong” to “this will create jobs for more Alabamians.” The pure mean-spirited nature of the comments and personal attacks were hard to read at times. It is being called the toughest illegal immigration bill in the US, modeled after the Arizona law but supposed to be foolproof when it hits the courts. Again…people smiling broadly like this is something to be proud of in a state where race relations and violations of civil rights are well-known. 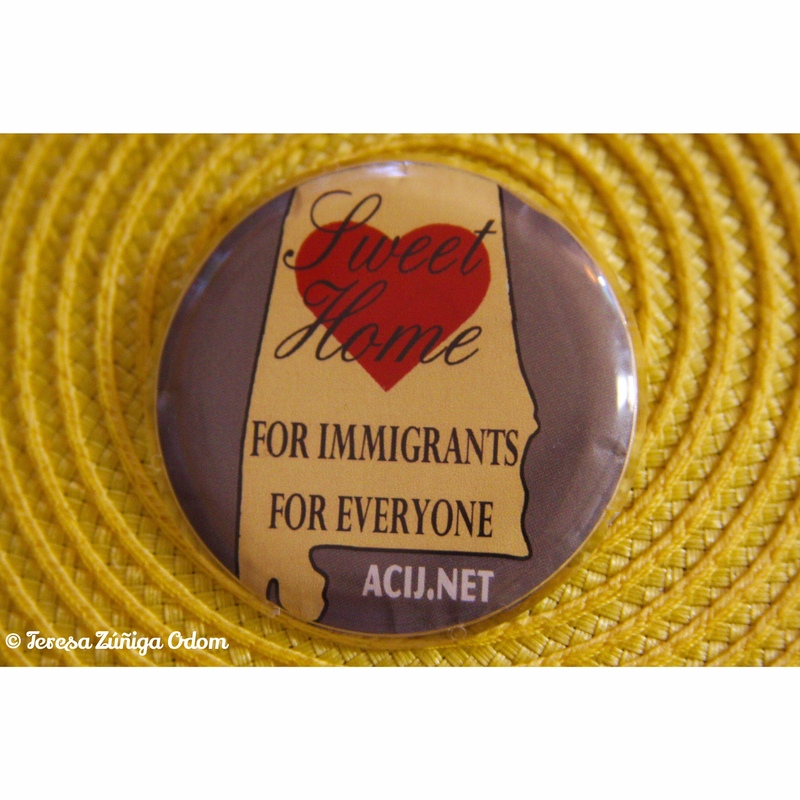 People across the US once again are looking at Alabama as the epicenter of discrimination – only this time it is against our “brown” brothers and sisters. Haters spouting that we are a nation of laws and they must be enforced…quick to forget that just 50 to 60 short years ago segregation was the law of the land and it was clearly unjust. It seems incredible to look back at such a short time ago and think people thought that was okay. I’m sure people asked themselves then…WHO are we that we would think this is right…clearly we are better than this. And many set out to change things…and were successful. 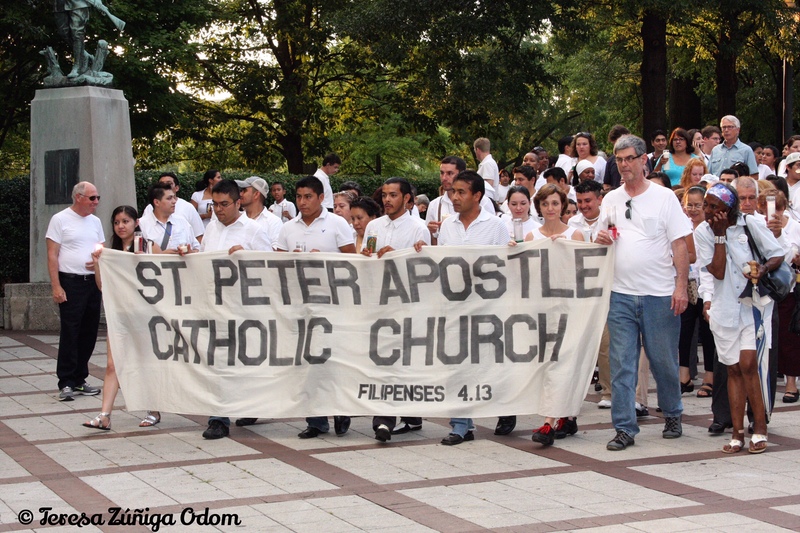 St. Peter Apostle Catholic Church leads the marchers out of Linn Park. Clearly we are better than this once again. People can’t truly believe this law is just. If you lived in Alabama in the 60s – like my husband did – you must have the perspective that this is wrong. Do we really want to go through all that again? Well the march on Saturday evening set out to prove we have learned something from our history and we ARE better than this. The march was organized by the faith community…and churches of all denominations were present and denounced this law as morally wrong. Organizers expected about a thousand people but clearly word got out and people – feeling like they had to do “something” – showed up in bigger numbers. I think the final estimate was about 2,500 attendees. 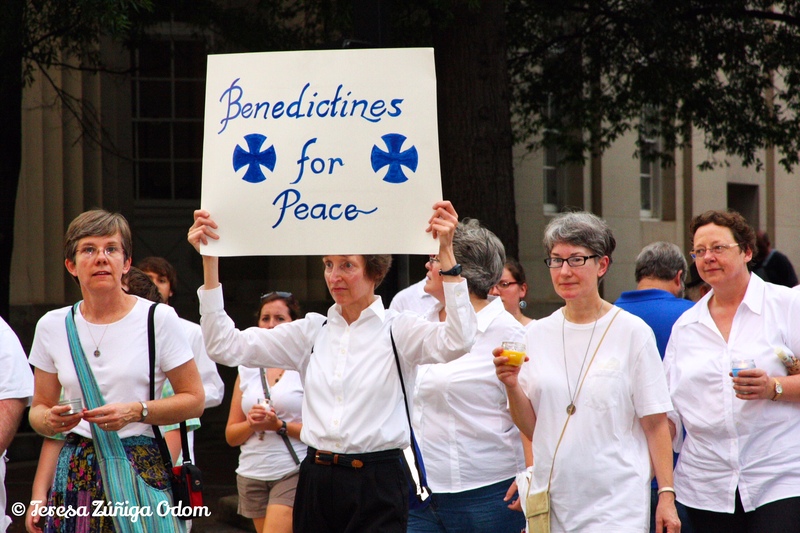 Benedictine nuns…some from out of state…joined in the march. 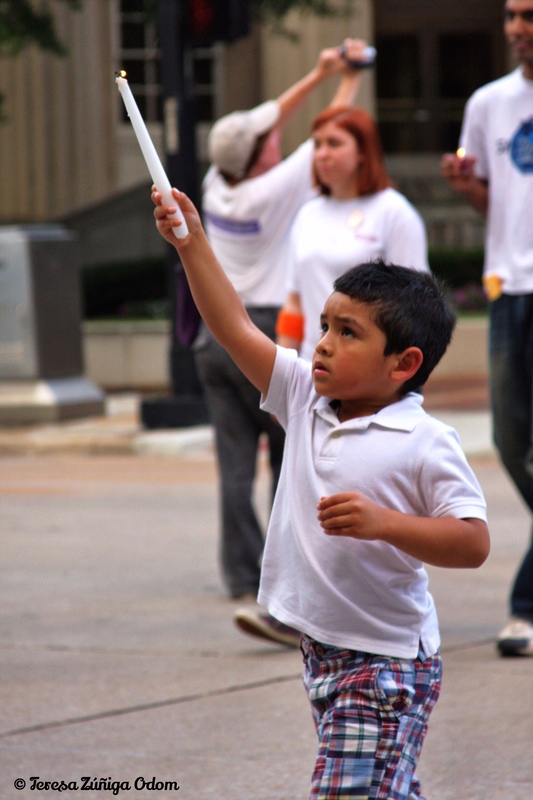 Many families joined in the march…children rode on the shoulders of their fathers. 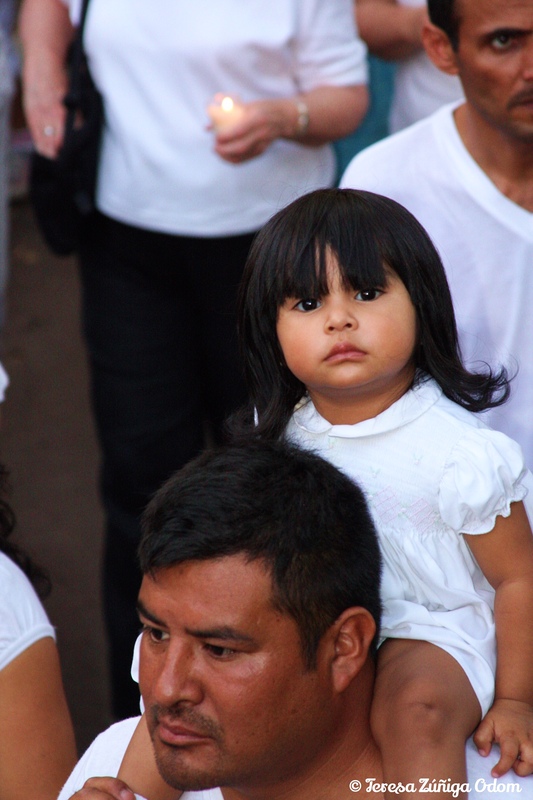 This sweet little girl stayed on her father’s shoulders during the entire march. The crowd was diverse too with about half being Hispanic but the other half was quite a mix. I’m sure there were many documents AND undocumented who would have liked to have been there but were afraid and I can’t blame them. The police were present but they were there to make sure the marchers were safe and the Spanish language radio stations tried to get that word out. Still…fear is real right now…you could see it in some of the marchers eyes and you could hear it in the stories being told to one another throughout the evening. Marchers re-enter Linn Park after walking peacefully through the streets of Birmingham. She’s right…music unifies and in this case we do need something – a song, a slogan…something that people can grab on to and pull us together. Maybe others are thinking the same thing and just maybe this will be something organic that grows from further marches and protests to this dreadful law. We ARE better than this…I think we proved that Saturday night at Linn Park and through the streets of Birmingham. 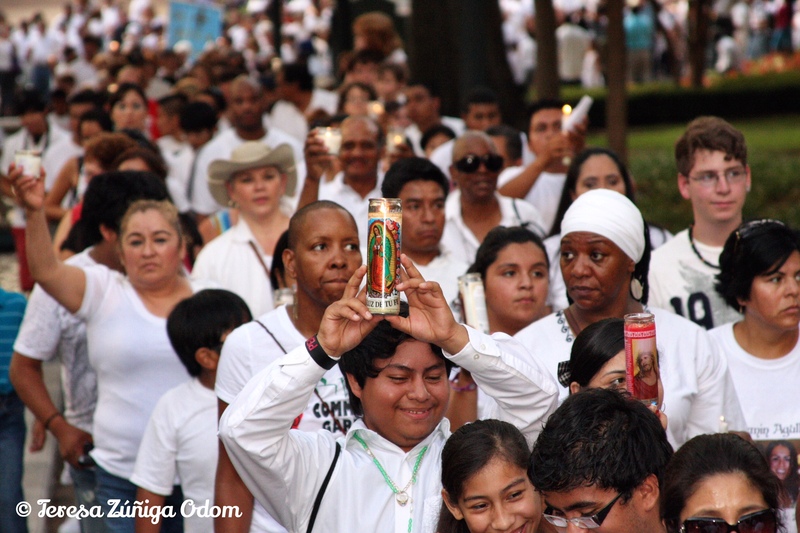 This entry was posted in HICA, Hispanic, Immigration and tagged Candlelight Vigil, HB56, Immigration March, Linn Park on August 9, 2016 by Southern Señora.